The Clinton-Massie High School varsity softball team, from left to right, front row, Vanessa Wilson, Alyssa Hickey, Victoria Sivert, Kendall Anderson, Lindsey Carter, Alexis Doan; back row, Sara Hodge, Abby Schneider, Kayla Drake, Taylor Florea, Hailey Clayborn, Natalie Lay. 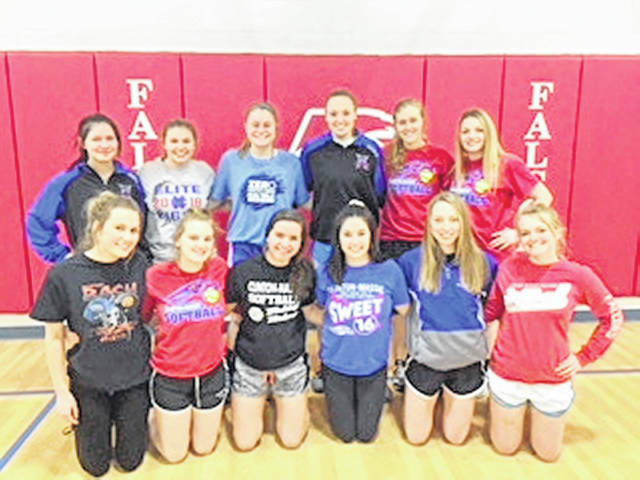 It will be difficult to improve on the 2018 season for the Clinton-Massie High School softball team. The Lady Falcons were 24-5 last year, SBAAC American Division champions and Region 8 runnersup. But head coach Anthony Lauer is confident his squad can make another run at the state tournament. “I think there is the potential for us to have another good season,” said Lauer, who is in his seventh season as the CM head coach. “We are playing a very competitive Division I schedule, like always, and this will make us better when tournament time comes around. Once I get girls feeling more comfortable in their roles things will come together. Senior Taylor Florea returns for another dominant season in the circle for Massie. Classmate Hailey Clayborn will catch the offerings of Florea and the other CM pitchers. Alexis Doan, Victoria Sivert (.412, 30 RBI), Lindsey Carter (35 RBI, Kendall Anderson and Natalie Lay (.457, 9 HR, 35 RBI) return to give the Lady Falcons as potent offense. Among the losses are second team All-Ohio selection Kelsey Carter, who hit .476 last year with 31 runs batted in. Also, Claire Carruthers, Ashlie Miller and Lindsey Amberger were integral parts of the 2018 squad that are not back. In addition, Lauer’s longtime coaching sidekick Greg Clayborn will not return to the bench. Josie McElroy will be the varsity assistant and Jamey Snyder is the reserve coach. Several newcomers – Kayla Drake, Sara Hodge, Vanessa Wilson, Abby Schneider – are expected to contribute, Lauer said. https://www.wnewsj.com/wp-content/uploads/sites/22/2019/03/web1_SFT_massieteam.jpgThe Clinton-Massie High School varsity softball team, from left to right, front row, Vanessa Wilson, Alyssa Hickey, Victoria Sivert, Kendall Anderson, Lindsey Carter, Alexis Doan; back row, Sara Hodge, Abby Schneider, Kayla Drake, Taylor Florea, Hailey Clayborn, Natalie Lay.